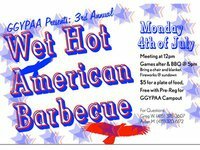 GGYPAA will be presenting the 3rd Annual Wet Hot American BBQ on July 4th at the Fort Mason Greens in San Francisco, Ca. Co-hosted by, ICYPAA, SACYPAA, EBYPAA, NAPYPAA, SCCYPAA, SOCYPAA and the Waterfront Group. The event will begin at noon, meeting at 1pm, Games will go all day with a BBQ at 5pm. The BBQ is a $5 suggested donation but free with pre-registration for GGYPAA Campout July 29-31st. Fireworks will be set off that evening around 9pm.